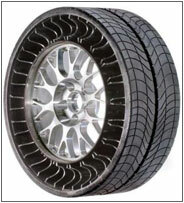 The flexible tire idea is from a Michelin tire called a Tweel, which I wrote about in 2005. In the referenced article, I compared it to the smartwheels from Neal Stephenson's 1992 novel Snowcrash. I like the idea of turning them sideways and using them as a turbine for lift. It's a slightly less radical (but possibly workable) version of Doc's idea for a flying car from Back to the Future.